Cinco de Mayo wouldn't be complete without chips and salsa. 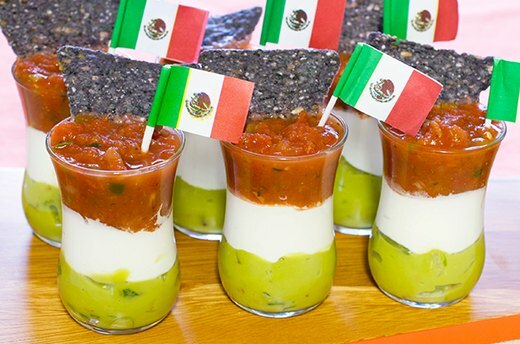 These Mexican flag-themed chip dip shooters go great alongside a classic margarita, and are super simple to make. Whether you prefer homemade or store-bought guacamole and salsa, these shooters are sure to get the fiesta started! Read on for instructions, and don't forget to check out the guacamole and salsa recipes at the end of the slideshow. 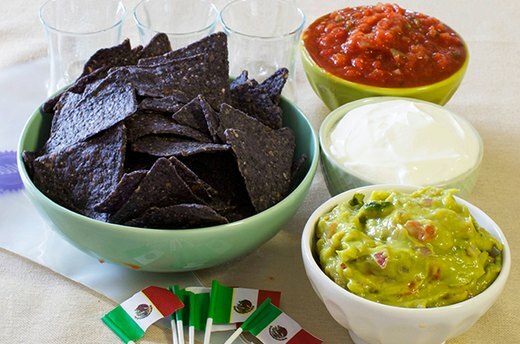 To make the chip dip shooters, you'll need guacamole and salsa (recipe ideas can be found on the final slides), sour cream, large shot glasses, your choice of tortilla chips, two pastry bags, and optional toothpick Mexican flags or other small festive decorations. 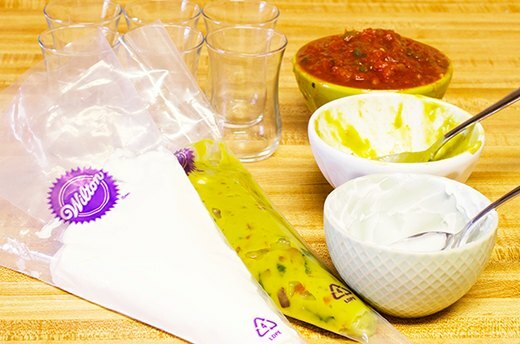 Spoon the guacamole and sour cream into two separate pastry bags. The pastry bags allow you to create cleaner layers than if you were to simply spoon the ingredients into the glasses. Note that you can also use the inside corner of a large zipper bag if pastry bags aren't available. Cut off the end of the pastry bag, making a small hole. 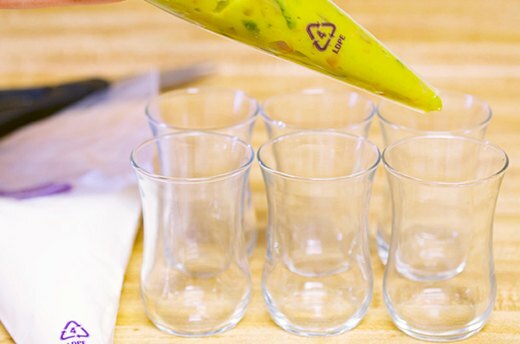 Press the bottom of the pastry bag deep into each glass shooter and squeeze, creating a layer of guacamole filling one third of the glass. 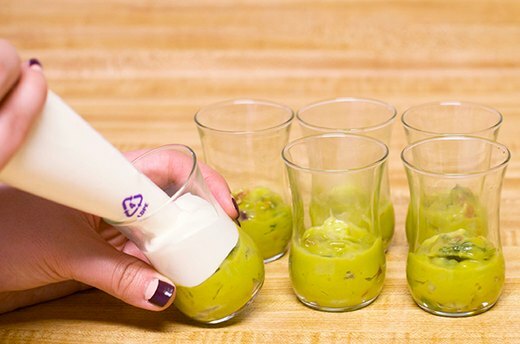 Make a layer of sour cream with the pastry bag on top of the guacamole for each shooter, using the technique described in the previous slide. 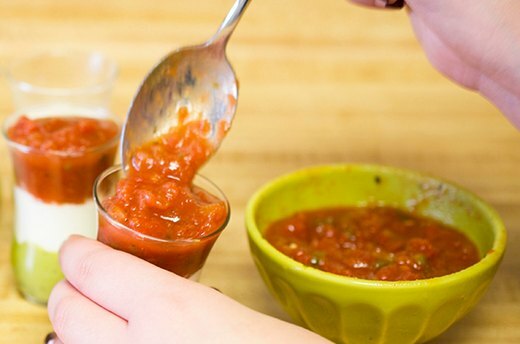 Pour a spoonful of salsa into each shooter, filling each glass to the brim. Salsa is more runny than guacamole and sour cream, so there is no need to use a pastry bag for this layer. Break off one corner of a tortilla chip, and stand it up in the salsa layer of each shooter. You can use any kind of tortilla chip that you like. 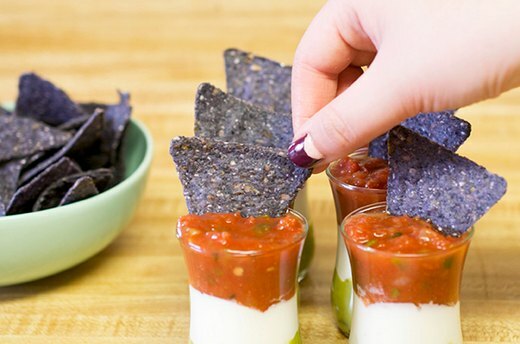 For an added Cinco de Mayo touch, place a Mexican flag toothpick in each chip dip shooter. Serve with extra chips--the smaller the pieces, the better, to make for easy dunking in these petite containers. Enjoy! 1) Rinse, dry and finely chop the tomato and cilantro. 2) Scoop the insides of the avocados into a medium sized bowl and mash with a fork to desired consistency. 3) Carefully stir in the tomato, cilantro and fresh lime juice. 4) Add salt and pepper to taste. 1) Pre-heat oven to "broil" setting. 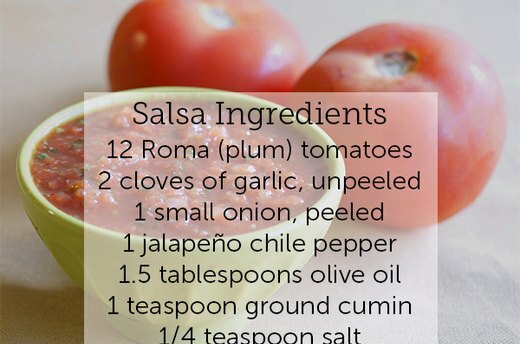 2) Cut tomatoes and onion into chunks and place in an oven-safe dish with the garlic and jalapeno chile pepper. 3) Drizzle the vegetables with olive oil and place in the oven. 4) Broil for 5 to 10 minutes, or until vegetables are soft and slightly browned. 5) Remove the dish from the oven and discard the jalapeno stem and garlic skins. 6) Place dish contents into a food processor or high-speed blender and pulse until coarsely chopped. 7) Transfer blended ingredients to a bowl and mix in cumin, cilantro, lime juice and salt.